Any corrections, additional information, pictures or news gratefully welcomed. The Renown in a longer form also became available for single deckers, the LTL class, that were numbered in the LT series. LGOC had plans to build its own chassis at this time, so the early LTs and Ts were accompanied by prototypes of the two Chiswick chassis, the CC and CB classes. The former - also six-wheeler double-deckers - were also numbered in the LT class. The use of a six-wheel chassis came from the London bus company's wish to pack in as many passengers as possible, within the legal constraints on length, weight and axle loading imposed by the Metropolitan Police and the Traffic Commissioner. 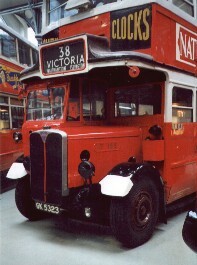 That only 54 (or 60 in the production run) could be seated in a vehicle a foot longer than an RT or a Routemaster was a consequence of the severe weight limits then imposed. The Traffic Commissioner would not let such long vehicles go everywhere either, and imposed considerable restraints on the routes they were allowed on, so many routes were limited to the 50-seater STs. (It was a long time before deregulation and 36 foot buses!). At the start they had petrol engines, but experiments with diesel engines soon convinced London Transport that this was the way to go with the LT class. A conversion programme in 1934 saw many of the LTs converted, with their petrol engines going to new STL buses. Most of the remaining double-deckers were converted in 1939 and 1940 but a substantial number retained petrol engines to the end of their days, including nearly all the open staircase variety. These should have been replaced by new RTs in 1940, but the war delayed this programme. So it was still possible after the war to travel in central London on an open-staircase petrol-engined bus: but not for long! The Bluebird buses captured the public imagination. For the first time, perhaps, this was a really good-looking bus. They had style. They had presence. They were the monarchs of the road. They were, as Flanders and Swann put it so memorably, the big six-wheeler, diesel-engined, 97 horse-power omnibus! 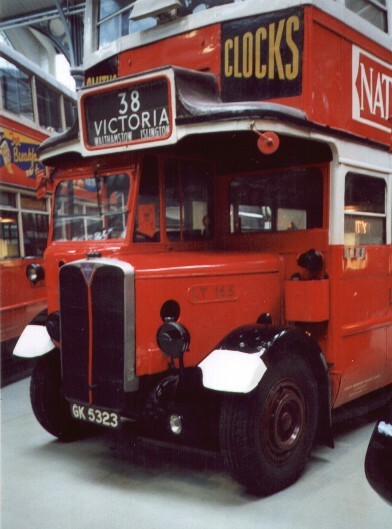 Although LGOC wanted to move towards modern bus design, with inside staircases and drivers' windscreens, it decided not to put all its eggs in one basket. So while the ST had these refinements (! ), the prototype LT retained an open staircase. The first fifty LTs also managed to get away with having windscreens, until the Police (Public Carriage Office) made them stop. (Presumably drivers who were not being continually kept awake by a face full of flies and/or rain were a menace to the travelling public). LT1 was a significant improvement on the previous General six-wheelers, the London Six (LS) class. Improved chassis design meant that the body was much lower, rather than being perched precariously on high as in the previous generation. The body looked modern, with a square cut cab body-mounted at the front, roller blinds front and rear, and a generous supply of opening windows. These windows were unique in the class, for the radiused top corners appeared not only on the frame louvres but on the opening panels too. Another feature that remained unique to the prototype was the treatment of the front panelling between decks. It had radiused corners and a flat front, with two windows arranged at a slight angle above. But despite aluminium panelling it was heavy (7t 14cwt). It was built with 54 seats, 30 upstairs and 24 below, with inwards-facing bench seats over the rear wheels. Although the later LT buses had more seats and were heavier, this 1929 -built bus seems to have been stuck with a lower weight limit, for it was never rebodied or re-seated to carry 60. These were similar to LT1, but seated 60 (H32/28O), giving a licensed weight of 7ton 18cwt. They had the front panels bevelled-in below the front upstairs windows, and the opening windows were standardised with radiused corner on the louvres but not the drop panels. The first 49 had windscreens from new, while the others had to wait a year before the Public Carriage Office relented. There were two batches of bodies. The first batch had the square cab of the prototype (LT2), whilst the later batch had the round-cornered cab like the standard STs (LT2/1). The 5 spare bodies later produced for the overhaul round were of the second pattern, so the bodies floated about within the 2LT fleet. There were some anomalies and experiments within the type. LT35 and LT41 had experimental AEC 8-cylinder engines fitted when new, but these were replaced with standard 6-cylinder engines at their first annual overhaul. LT21 was the major odd-ball: it was fitted with a 7.7litre diesel engine in 1935, as type 2/2LT2/2. It was sent to Mortlake (M) to operate alongside the 8.8litre AEC-Ricardo engined LTs (4LT). It remained the only diesel-engined LT2. In 1940 it was fitted with an inside staircase spare body, becoming type 2/12LT3/4, but stayed with its diesel cousins at Mortlake. LT 26 also received an inside staircase body in 1945, but kept its petrol engine. It was sent to Plumstead. An unsatisfactory feature on the new buses was soon recognised to be the tiny front destination blind. This was a standard fitting taken from the Reliances, but whilst it sufficed for the single-deckers it did not suit a central London double-decker. So the type was retro-fitted with a somewhat larger external display box at the front, whilst a really satisfactory display had to await the LT5 bodies. This made Loughton a fully LT garage, but did not provide enough LTs for Plumstead. Consequently some of the first batch moved to Plumstead from Hanwell and Cricklewood, (where they were replaced by new STs). The start of the war saw the withdrawal of petrol engined buses, and these early LTs were among them. They were due to be replaced by new RTs in 1940 anyway. But the cuts in services had been too severe, and the stored LTs were soon out on the road again. Their greater carrying capacity was needed for the extra traffic generated by the war. Remarkably few were damaged severely by bombing, although a couple of bodies were totally destroyed and a few more needed almost complete rebuilds. But no chassis were destroyed, and float bodies replaced the wrecked ones, so the open-staircase LTs finished the war intact. During the war years some went to Potters Bar (PB). The arrival of peace did not see the class retired either. Despite the immediate post-war inrush of utility Guys and Daimlers, the traffic growth was phenomenal, and every bus that could run was pressed into service. The arrival of the post-war STDs displaced them from most of their traditional routes: including the 10, 10A, 35, 38 and 38A, from Leyton (T) and Loughton (L) garages. Potters Bar (PB), received their allocation of STDs, displacing LTs, and promptly swapped them with Loughton for their old favourites! The displaced LTs were dispersed to a variety of garages for use as rush hour extras. The end came relatively swiftly in 1948 and 1949, as the new RTs relieved the stresses of the fleet. The open staircase fuel-guzzling LTs finally went to the scrapyards, having given twice their design life in service. outside stair LT histories photo references Ian's Bus Stop LT index. outside stair LTs. Part 2: the CCs. Insiders.